People always asking me can you like my Facebook page for my crowdfunding project? I’m like ‘YES’ secretly knowing that I’m unlikely to see any of their posts on my newsfeed ever again. I should tell them the truth about Facebook, the fact that the Facebook page is useless and that none of their crowdfunding project posts will get any coverage meaning all their effort at thinking about what to post is a waste of time. I’m not saying your Facebook page no longer serves a purpose, it still does if you do it right. I’m going to show you how to still maximise your page, it will cost you though and no I’m not talking about charging a fee I’m talking about paying our good friend ‘Mark Zuck’ through ads. For people who are launching crowdfunding projects, I’d recommend sticking to things around your audience i.e relevant industry news about the product, product pictures, videos etc. You should be able to create a content strategy around the material and be looking to drip feed the content to the audience. Don’t give away everything at once, build it up the excitement without giving everything away on your page. Content should be from Facebook friendly sources, no point posting a link from Youtube or Reddit as Facebook doesn’t own any of these so it definitely will do all in its power to put the least effort showcasing it. 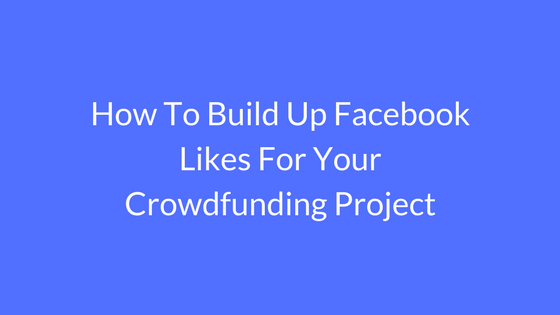 Your first aim should be to build up the Facebook page for your crowdfunding project, you want to get from 0 to 200 fans as quickly as possible. I’d invite a small group of friends onto the page so it doesn’t look too empty but you should be looking to grow an organic presence. Invest some money into ads $5 a day should do the trick if you want to build slow and have time, create ads that sell your product to the audience. You will notice you start getting likes….after 24hrs click on the page post that you promoted and invite the people who have liked the post. Keep repeating this and you’ll see your page grow to 200. This will get people signing up to for your project launch. You’ll also get a whole bunch of new likes along the way, so what you need to do is repeat the whole cycle.